In the same way, the Messiah did not take upon himself the glory of being a high priest. 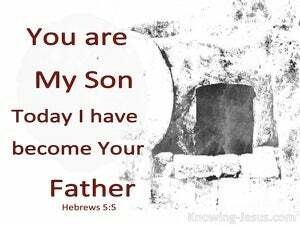 No, it was God who said to him, "You are my Son. Today I have become your Father." So also Christ did not glorify himself to become a high priest, but it was he who said to him, Thou are my Son, today I have begotten thee. So, Christ also did not take on Himself the honor of becoming head priest, but God said to Him [Psa. 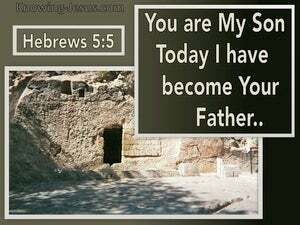 2:7], "You are my Son; today I have conceived you." Wherefore Christ himself did not assume the character of an high priest; but it was confirm'd by him that said, "thou art my son, to-day have I begotten thee." Thus the Christ also has not glorified himself to be made a high priest; but he who had said to him, Thou art my Son, I have to-day begotten thee. So even Christ did not claim for himself the dignity of the high priesthood, but he was appointed to it by him who said to him, "You are my Son! I have today become your Father!" So also Christ glorified not himself to be made an high priest, but he that said to him, Thou art my son, this day have I begotten thee. So also the Christ did not glorify himself to make himself high priest; but he that said unto him, Thou art my Son; today have I begotten thee. So also Christ honoured not himself, to become chief priest; but he having spoken to him, Thou art my Son, to day have I begotten thee. So also Christ glorified not himself to be made a high priest; but he that said unto him, You are my Son, today have I begotten you. Thus also Christ did not glorify himself to become high priest, but the one who said to him, "You are my Son, today I have begotten you,"
So also Christ did not glorify Himself to be made a high priest, but He who said to Him, "You are My Son, today I have begotten You." Even so, likewise, Christ glorified not himself, to be made the high priest: but he that said unto him. "Thou art my son, this day begat I thee." Similarly Christ was not raised to the glory of the high priesthood by himself but by Him who declared to him, Thou art my son, to-day have I become thy father. So also Christ did not glorify himself in becoming high priest, but the one who glorified him was God, who said to him, "You are my Son! 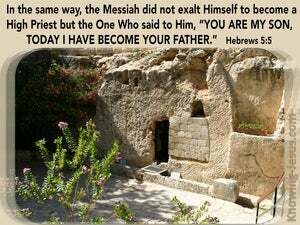 Today I have fathered you,"
So also Christ did not glorify himself to be made a high priest, but it was he who said to him, "You are my Son. Today I have become your father." Thus Christ did not glorify himself to be made highpriest, but he who said to him, "Thou art my Son, I this day have begotten thee;"
So Christ also did not himself assume the glory to become high-priest, but he [gave it] who spake to him, "Thou art my Son; I have this day begotten thee." So also Christ glorified not himself to be made a high priest; but he that said to him, Thou art my Son, to-day have I begotten thee. So Christ also did not claim for Himself the honour of being made High Priest, but was appointed to it by Him who said to Him, "My Son art Thou: I have to-day become Thy Father;"
So Christ too did not take upon Himself the glory of being appointed High Priest, but it was God who said: "You are my Son; I have today become your Father,"
So also Christ didn't glorify himself to be made a high priest, but it was he who said to him, "You are my Son. Today I have become your father." So also Christ did not glorify himself to be made an high-priest; but He that said unto Him, "Thou art my Son, this day have I begotten thee." 4 And no one takes the honor to himself, but receives it when he is called by God, even as Aaron was. 5 So also Christ did not glorify Himself so as to become a high priest, but He who said to Him, "YOU ARE MY SON, TODAY I HAVE BEGOTTEN YOU"; 6 just as He says also in another passage, "YOU ARE A PRIEST FOREVER ACCORDING TO THE ORDER OF MELCHIZEDEK." 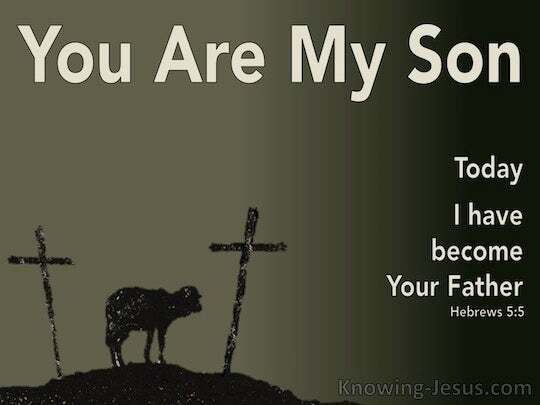 "I will surely tell of the decree of the LORD: He said to Me, 'You are My Son, Today I have begotten You. For to which of the angels did He ever say, "YOU ARE MY SON, TODAY I HAVE BEGOTTEN YOU"? 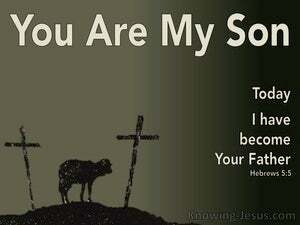 And again, "I WILL BE A FATHER TO HIM AND HE SHALL BE A SON TO ME"?